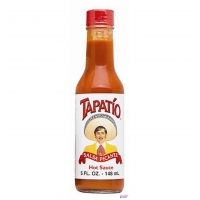 Tapatio Hot Sauce entered the business world in 1971, when Mr. Jose-Luis Saavedra, Sr. started his company. As with most great products, Tapatio's beginnings were very modest. Still working a daytime job to supplement his income in order to cover business expenses. In 1985 after years of constant growth, Mr. Saavedra realized he needed a bigger warehouse. Tapatio moved into a new 8,500 square foot warehouse. Always popular in the Hispanic community but in 1988 Tapatio Hot Sauce was now crossing over and becoming a staple in American, European households. The mission was providing the highest quality product at the best price to his valued customers. In 1996 it become a nationwide leader in the hot sauce industry, Tapatio saw record sales. Fully incorporated Tapatio Hot Sauce celebrated in 2006 his 35 years of providing high quality hot sauce to our valued customers. This could not have been accomplished without our customer's loyal patronage and help in spreading the word of our great tasting hot sauce. Es una Salsa ... muy salsa Tapatío is a classic Mexican spicy sauce made of chilies with a strong spicy flavor.